Since the launch of Uniting With You Home Care in 2016, we have had the same core team of nurses (RNs and LPNs), Home Health Aides (HHAs), Homemakers/Companions and office/administrative staff. With our long tenure in the industry and relationships with hospitals and other agencies, we are able us to secure additional caregivers based on particular client needs, if necessary. Our caregivers are thoroughly screened, bonded and insured. We work closely with our patients, your family, physicians and hospital discharge planners to develop a personalized care plan for each patient, ensuring that you are provided with the appropriate nursing, personal care assistance and supportive care services. Maria Cid has known Ruth Chabot for the 20+ years she has worked in health care. 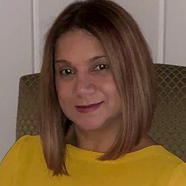 Focused primarily on seniors, Maria’s background includes roles as Home Health Aide in various setttings including hospitals, nursing homes and senior centers. Deeply committed to caregiving as a career, she earned her degree and became a nurse (LPN) in 2009. Soon after, she transitioned to a career in home care and has never looked back. Co-founder of Uniting With You Home Care, she also assists with marketing the agency.